During his playing days in the National Football League, Reggie White was a star whose preaching prowess earned him the nickname the “Minister of Defense.” But after retiring, White began to question the role of Christianity in his life and even claimed that he had been “prostituted” by religious leaders because of his fame. “Most people who wanted me to speak at their churches, only asked me to speak because I played football,” White explained, “not because I was this great religious guy or this theologian” (190). White also had second thoughts about his claims that God had spoken to him, now tacitly acknowledging that the huge contract that the Packers dangled in front of him had more to do with his move to Green Bay than had religion. A chastened White announced that he wanted to try to live the principles of his faith rather than just speak to them. Tired of being a “motivational speaker” and “entertainer,” White stopped peddling jock evangelism and instead turned inward to study his faith (190). For Tom Krattenmaker, Reggie White’s doubts about his evangelism serve as an important warning about the excessive and misguided role that evangelical Christianity currently plays in the professional sporting ranks. In Onward Christian Athletes, Krattenmaker has two principle tasks: first, he “uncover[s] the large part of the religion-in-sports iceberg hidden beneath the water” (2). To keep the iceberg less than Titanic-sized, Krattenmaker focuses exclusively on “the big three” of professional sports—football, baseball, and basketball—in order to show how conservative evangelical Christians have led a concerted effort to exploit professional sports and its concomitant star power for the purpose of evangelism. In telling his story, Krattenmaker, a progressive writer on religion in American life, is careful to humanize his subject. He disabuses his readers of the idea that these are simply “crazy” evangelicals, and is clearly impressed by their efforts to “out-hustle” the other religions in their quest to seize control of religion in professional sports (9). Nevertheless, the development of this uneven religious playing field bothers the author and leads him to his second task: drawing up a proposal to reform the role of religion in professional sports. In short, Krattenmaker aims not “to do away with religion in sports,” but rather to “make it better” (6). For Krattenmaker, that means that religion in professional sports should be less about evangelism and more about religious pluralism; it should be less about cozying up to conservative political causes and more about serving as the conscience against the “sports industry’s ‘sins’” (7). Krattenmaker’s greatest contribution is illuminating just how pervasive the recent rise of the evangelical Christian right has been. We often hear how leaders like Pat Robertson and Jerry Falwell helped forge a social movement of conservative evangelical Christians that entered the political fray, but Krattenmaker details how evangelicals brought similar energy and ideas to the world of sports. Indeed, the effort to bring religion into the professional sports arena is not merely the sum of every jock pointing heavenward after a big play or praising God in the post-game interview; rather, it is the product of a concerted effort by dedicated evangelists. Beginning in 1954, the Fellowship of Christian Athletes (FCA), with the blessing of the legendary Branch Rickey, began using sports “heroes” to promote Christianity to those who “idolized” them. Significantly, early in the FCA’s history, this “granddaddy” of sports ministries turned down suggestions to become the Fellowship of Religious Athletes (18–19). In the 1960s, Athletes in Action (AIA) began an even more “aggressive evangelism,” one that relied on winning athletes winning souls for Jesus. In the early 1970s, the evangelical Baseball Chapel began serving ballplayers whose schedule prevented churchgoing. The organization immediately flourished. By 1975 the organization had a chaplain with every big league team, and it has since expanded to the minor leagues and overseas. 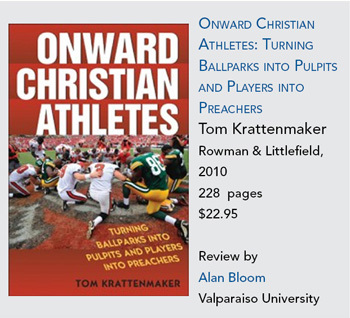 Krattenmaker acknowledges that Baseball Chapel provides church services and counseling for its congregants, but he considers the organization’s claim that salvation comes only through Jesus, as “inherently divisive and dismissive of other forms of belief” (98). By the 1990s, the evangelical presence in sports had become even more salient. Promise Keepers, a new Christian organization for men, adopted a masculine brand of evangelical revivalism and drew huge crowds to stadiums across the country. In the twenty-first century, the promotional and marketing whiz, Brent High, has used everything from biblical bobbleheads to “faith nights” to transform ballparks into de facto oversized religious revival tents. These faith nights, however, as Krattenmaker makes plain, are really evangelical nights where those sitting in the box seat pews can hear stars like John Smoltz deliver his “sermon on the mound” (117). The Colorado Rockies drew considerable attention when they announced that—from its pious players to its top executives who prayed together—it was “an organization guided by Christianity” (38). Krattenmaker, for all his criticisms, remains optimistic about a “faith-based reform agenda” (201). He is heartened by a recent change in leadership at AIA and by the fact that Catholics increasingly are embracing opportunities in sports ministry. Krattenmaker is convinced that a more constructive engagement between religion and pro sports can allow Christians to serve as “the conscience of sports” (208). How so? He wants to replace a “get-Jesus evangelism” with a sports ministry that seeks social justice, as well as addresses the problems endemic to American sporting culture (208). Specifically, Krattenmaker offers three suggestions. First, sports ministries should “serve as a prophetic force” for redressing racial injustice, particularly in sports, and thus work to ensure that African Americans and Hispanics receive the opportunities they deserve in the big leagues and prevent them from being exploited if they fail to make it (201). Next, Krattenmaker believes that Christian missions in sports must challenge the winning at all costs mentality that allows cheating—think, for example, performance enhancing drugs—which have become as much a part of sports as the singing of the national anthem. Krattenmaker argues that Christians must question their blind devotion to the “god of victory” (203). Finally, Krattenmaker wants to see the creation of “a fair and level religious playing field in the world of pro sports,” one that is defined by “inclusiveness” (205). To that end, the author recommends that professional sports scrap the chaplaincy that is the exclusive territory of evangelicals and replace it with a pluralistic system such as those found in hospitals or in the military. Moreover, Krattenmaker acknowledges that nothing can be simply handed to anyone, and therefore, recommends that “moderate Christians, religious minorities, and nonbelievers would do well to take a page from the evangelicals’ book and insert themselves into the action” (207). I do not share Krattenmaker’s optimism for reform. The nature of this sort of book is that the diagnosis is usually more on target than the cure, and that is the case here. Major league sports have accepted the expansion of religious missionary events over recent years, because they were consistent with selling more tickets. But Krattenmaker’s agenda for social justice does not provide a winning gambit for the bottom line. Similarly, major league franchises will stop inviting religious organizations into the fold if religious leaders begin to question, denounce, or simply take away from the luster of the game. Furthermore, though Krattenmaker recognizes that the US is the most religious nation in the West and the most religiously diverse, it does not simply follow that other faiths will want to, or be able to, follow evangelical Christians into the sporting arena. Indeed, when I think of the congregation in which I was raised, Temple Emanu-El, it would not be hard to imagine Rabbi Landsberg leading us to Yankee Stadium for a game. But when I consider the prospect of Rabbi Landsberg leading us to the stadium for rest, relaxation, and a retreat, I cannot stop from laughing at the incongruity of such an outing. We do not take our religious act on the road—not even to home games, and while we may be fans of the Yankees, we are not fans of proselytizing or religious pep rallies. Muslim Americans also present a challenge to Krattenmaker’s call for pluralism. Under the current religio-political climate, it is hard to fathom Muslim Americans wanting to hold a faith night at a stadium, but it is equally hard to imagine professional sports organizations aiding in such a visit with its potential for negative publicity or a possible financial hit at the turnstiles. As for atheists’ “faith night,” I will leave it to the good folks at Saturday Night Live to design that event. To be fair, Krattenmaker’s position that we should not eliminate religious significance and events from the ballpark is tenable. But once stadiums cease to be solely civic arenas and become at least in part religious spaces, Krattenmaker’s sanguine call for democratization and social justice will be overshadowed by the reality that not everyone will feel equally welcome in an environment of “peanuts, popcorn, and proselytizing” (119). Alan Bloom is Associate Professor of History at Valparaiso University.